Bacon Goddess: The End of the Bacon Craze? Not When You Have Bacon Ice Cream! The End of the Bacon Craze? Not When You Have Bacon Ice Cream! This is the photo featured in the WSJ article. Yeah, like THAT helps with their point. YUM! Say it ain't so! I just started this blog! 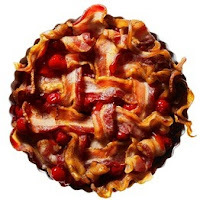 "We are in the midst of a bacon bubble—and a growing number of chefs (some of whom quietly admit they helped inflate the bubble to begin with) say it's about to pop." But the article was written in October of last year and I haven't seen a bacon slowdown yet! "'It's been overplayed so much and my taste buds are tired of it,' says Mr. Oringer, who now swaps it for less shopworn ingredients. If he's looking for smoke with little fat, he'll toss a smoked turkey wing into the pot. Trout wrapped in bacon is a gastronomic trope, but trout's delicate flavor is easily masked, Mr. Oringer says. I don't understand how one's taste buds can get tired of bacon. I mean, really, can someone explain this to me? I suppose if you were to sit down and eat a a whole pound of bacon by itself, no matter how delicious it was, you might get tired of the taste? Of course, just as I finished reading that article, I found another talking about the BACON ICE CREAM SANDWICH available at a sandwich shop called Meat & Bread in Toronto, Ontario. And this article was published today. So there! "Occasionally, customers do balk at the combination of bacon and maple ice cream, he says. 'But then they seem to enjoy it when they start eating it.'" Great article about trends in combining sweet and savory in one food. Yes, in my expert opinion, the bacon craze is still going strong. But you know what? Even if someone turns down the heat and the sizzle stops, bacon is still good cold.